The heart is made up of cardiac muscle. 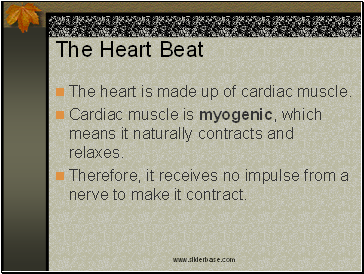 Cardiac muscle is myogenic, which means it naturally contracts and relaxes. Therefore, it receives no impulse from a nerve to make it contract. The cardiac cycle is initiated by a small patch of muscle called the Sinoatrial node (SAN) or pacemaker. This node sets the rhyth for all the other cardiac muscle. Pacemaker cells have an inbuilt rhyth that is faster than the other cells in the heart. The SA node sends out an excitation wave of electrical activity over the atrial walls. The cardiac muscle responds to this wave by contracting at the same speed as the SAN. This results in both atria contracting simultaneously. 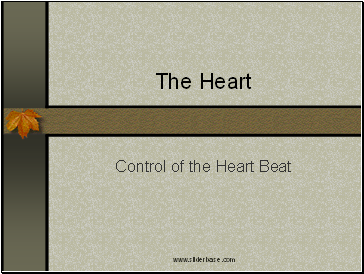 There is a delay between atrial contraction and ventricular contraction. Fibres between the two chambers that do not conduct the excitation phase cause this delay. Therefore, the wave is conducted through a patch of fibres in the septum known as the atrio-ventricular node or AVN. After about a delay of 0.1 seconds the AV node passes the wave onto another set of conducting fibres that run down the centre of the septum between the ventricles called the Purkyne fibres. The wave is then transmitted (very rapidly) down to the bottom of the septum, where it spreads through the ventricles’ walls in an upward direction. This movement causes the muscle to contract and the ventricles squeeze the blood out of the heart. Fibrillation is the result of the contractions of the atria and ventricles becoming erratic and out of sync. Using electric shock treatment to restart the SA node can rectify the problem.